DNA polymerases are enzymes that synthesize DNA molecules from deoxyribonucleotides, the building blocks of DNA. These enzymes are essential for DNA replication and usually work in pairs to create two identical DNA strands from a single original DNA molecule. During this process, DNA polymerase "reads" the existing DNA strands to create two new strands that match the existing ones. DNA polymerase adds nucleotides to the three prime (3')-end of a DNA strand, one nucleotide at a time. Every time a cell divides, DNA polymerases are required to help duplicate the cell's DNA, so that a copy of the original DNA molecule can be passed to each daughter cell. In this way, genetic information is passed down from generation to generation. Before replication can take place, an enzyme called helicase unwinds the DNA molecule from its tightly woven form, in the process breaking the hydrogen bonds between the nucleotide bases. This opens up or "unzips" the double-stranded DNA to give two single strands of DNA that can be used as templates for replication. In 1956, Arthur Kornberg and colleagues discovered DNA polymerase I (Pol I), in Escherichia coli. They described the DNA replication process by which DNA polymerase copies the base sequence of a template DNA strand. Kornberg was later awarded the Nobel Prize in Physiology or Medicine in 1959 for this work. DNA polymerase II was also discovered by Thomas Kornberg (the son of Arthur Kornberg) and Malcolm E. Gefter in 1970 while further elucidating the role of Pol I in E. coli DNA replication. DNA polymerase moves along the old strand in the 3'–5' direction, creating a new strand having a 5'–3' direction. The main function of DNA polymerase is to synthesize DNA from deoxyribonucleotides, the building blocks of DNA. The DNA copies are created by the pairing of nucleotides to bases present on each strand of the original DNA molecule. This pairing always occurs in specific combinations, with cytosine along with guanine, and thymine along with adenine, forming two separate pairs, respectively. By contrast, RNA polymerases synthesize RNA from ribonucleotides from either RNA or DNA. When synthesizing new DNA, DNA polymerase can add free nucleotides only to the 3' end of the newly forming strand. This results in elongation of the newly forming strand in a 5'–3' direction. No known DNA polymerase is able to begin a new chain (de novo); it can only add a nucleotide onto a pre-existing 3'-OH group, and therefore needs a primer at which it can add the first nucleotide. Primers consist of RNA or DNA bases (or both). In DNA replication, the first two bases are always RNA, and are synthesized by another enzyme called primase. Helicase and topoisomerase II are required to unwind DNA from a double-strand structure to a single-strand structure to facilitate replication of each strand consistent with the semiconservative model of DNA replication. It is important to note that the directionality of the newly forming strand (the daughter strand) is opposite to the direction in which DNA polymerase moves along the template strand. Since DNA polymerase requires a free 3' OH group for initiation of synthesis, it can synthesize in only one direction by extending the 3' end of the preexisting nucleotide chain. Hence, DNA polymerase moves along the template strand in a 3'–5' direction, and the daughter strand is formed in a 5'–3' direction. This difference enables the resultant double-strand DNA formed to be composed of two DNA strands that are antiparallel to each other. The function of DNA polymerase is not quite perfect, with the enzyme making about one mistake for every billion base pairs copied. Error correction is a property of some, but not all DNA polymerases. This process corrects mistakes in newly synthesized DNA. When an incorrect base pair is recognized, DNA polymerase moves backwards by one base pair of DNA. The 3'–5' exonuclease activity of the enzyme allows the incorrect base pair to be excised (this activity is known as proofreading). 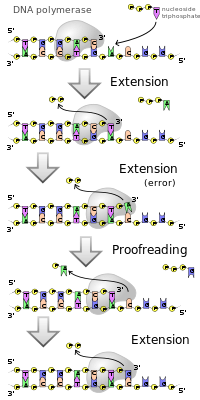 Following base excision, the polymerase can re-insert the correct base and replication can continue forwards. This preserves the integrity of the original DNA strand that is passed onto the daughter cells. Fidelity is very important in DNA replication. Mismatches in DNA base pairing can potentially result in dysfunctional proteins and could lead to cancer. Many DNA polymerase contain an exonuclease domain, which acts in detecting base pair mismatches and further performs in the removal of the incorrect nucleotide to be replaced by the correct one. The shape and the interactions accommodating the Watson and Crick base pair are what primarily contribute to the detection or error. Hydrogen bonds play a key role in base pair binding and interaction. The loss of an interaction, which occurs at a mismatch, is said to trigger a shift in the balance, for the binding of the template-primer, from the polymerase, to the exonuclease domain. In addition, an incorporation of a wrong nucleotide causes a retard in DNA polymerization. This delay gives time for the DNA to be switched from the polymerase site to the exonuclease site. Different conformational changes and loss of interaction occur at different mismatches. In a purine:pyrimidine mismatch there is a displacement of the pyrimidine towards the major groove and the purine towards the minor groove. Relative to the shape of DNA polymerase's binding pocket, steric clashes occur between the purine and residues in the minor groove, and important van der Waals and electrostatic interactions are lost by the pyrimidine. Pyrimidine:pyrimidine and purine:purine mismatches present less notable changes since the bases are displaced towards the major groove, and less steric hindrance is experienced. However, although the different mismatches result in different steric properties, DNA polymerase is still able to detect and differentiate them so uniformly and maintain fidelity in DNA replication. DNA polymerization is also critical for many mutagenesis processes and is widely employed in biotechnologies. The known DNA polymerases have highly conserved structure, which means that their overall catalytic subunits vary very little from species to species, independent of their domain structures. Conserved structures usually indicate important, irreplaceable functions of the cell, the maintenance of which provides evolutionary advantages. The shape can be described as resembling a right hand with thumb, finger, and palm domains. The palm domain appears to function in catalyzing the transfer of phosphoryl groups in the phosphoryl transfer reaction. DNA is bound to the palm when the enzyme is active. This reaction is believed to be catalyzed by a two-metal-ion mechanism. The finger domain functions to bind the nucleoside triphosphates with the template base. The thumb domain plays a potential role in the processivity, translocation, and positioning of the DNA. DNA polymerase's rapid catalysis is due to its processive nature. Processivity is a characteristic of enzymes that function on polymeric substrates. In the case of DNA polymerase, the degree of processivity refers to the average number of nucleotides added each time the enzyme binds a template. The average DNA polymerase requires about one second locating and binding a primer/template junction. Once it is bound, a nonprocessive DNA polymerase adds nucleotides at a rate of one nucleotide per second. :207–208 Processive DNA polymerases, however, add multiple nucleotides per second, drastically increasing the rate of DNA synthesis. The degree of processivity is directly proportional to the rate of DNA synthesis. The rate of DNA synthesis in a living cell was first determined as the rate of phage T4 DNA elongation in phage infected E. coli. During the period of exponential DNA increase at 37 °C, the rate was 749 nucleotides per second. DNA polymerase's ability to slide along the DNA template allows increased processivity. There is a dramatic increase in processivity at the replication fork. This increase is facilitated by the DNA polymerase's association with proteins known as the sliding DNA clamp. The clamps are multiple protein subunits associated in the shape of a ring. 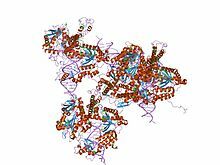 Using the hydrolysis of ATP, a class of proteins known as the sliding clamp loading proteins open up the ring structure of the sliding DNA clamps allowing binding to and release from the DNA strand. Protein-protein interaction with the clamp prevents DNA polymerase from diffusing from the DNA template, thereby ensuring that the enzyme binds the same primer/template junction and continues replication. :207–208 DNA polymerase changes conformation, increasing affinity to the clamp when associated with it and decreasing affinity when it completes the replication of a stretch of DNA to allow release from the clamp. Based on sequence homology, DNA polymerases can be further subdivided into seven different families: A, B, C, D, X, Y, and RT. Prokaryotes only have one RNA polymerase and it exists in two forms: core polymerase and holoenzyme. Core polymerase synthesizes DNA from the DNA template but it cannot initiate the synthesis alone or accurately. Holoenzyme accurately initiates synthesis. Prokaryotic family A polymerases include the DNA polymerase I (Pol I) enzyme, which is encoded by the polA gene and ubiquitous among prokaryotes. This repair polymerase is involved in excision repair with both 3'–5' and 5'–3' exonuclease activity and processing of Okazaki fragments generated during lagging strand synthesis. Pol I is the most abundant polymerase, accounting for >95% of polymerase activity in E. coli; yet cells lacking Pol I have been found suggesting Pol I activity can be replaced by the other four polymerases. Pol I adds ~15-20 nucleotides per second, thus showing poor processivity. Instead, Pol I starts adding nucleotides at the RNA primer:template junction known as the origin of replication (ori). Approximately 400 bp downstream from the origin, the Pol III holoenzyme is assembled and takes over replication at a highly processive speed and nature. DNA polymerase II, a family B polymerase, is a polB gene product also known as DnaA. Pol II has 3'–5' exonuclease activity and participates in DNA repair, replication restart to bypass lesions, and its cell presence can jump from ~30-50 copies per cell to ~200–300 during SOS induction. Pol II is also thought to be a backup to Pol III as it can interact with holoenzyme proteins and assume a high level of processivity. The main role of Pol II is thought to be the ability to direct polymerase activity at the replication fork and helped stalled Pol III bypass terminal mismatches. DNA polymerase III holoenzyme is the primary enzyme involved in DNA replication in E. coli and belongs to family C polymerases. It consists of three assemblies: the pol III core, the beta sliding clamp processivity factor, and the clamp-loading complex. The core consists of three subunits: α, the polymerase activity hub, ɛ, exonucleolytic proofreader, and θ, which may act as a stabilizer for ɛ. The holoenzyme contains two cores, one for each strand, the lagging and leading. The beta sliding clamp processivity factor is also present in duplicate, one for each core, to create a clamp that encloses DNA allowing for high processivity. The third assembly is a seven-subunit (τ2γδδ′χψ) clamp loader complex. Recent research has classified Family C polymerases as a subcategory of Family X with no eukaryotic equivalents. In E. coli, DNA polymerase IV (Pol 4) is an error-prone DNA polymerase involved in non-targeted mutagenesis. Pol IV is a Family Y polymerase expressed by the dinB gene that is switched on via SOS induction caused by stalled polymerases at the replication fork. During SOS induction, Pol IV production is increased tenfold and one of the functions during this time is to interfere with Pol III holoenzyme processivity. This creates a checkpoint, stops replication, and allows time to repair DNA lesions via the appropriate repair pathway. Another function of Pol IV is to perform translesion synthesis at the stalled replication fork like, for example, bypassing N2-deoxyguanine adducts at a faster rate than transversing undamaged DNA. Cells lacking dinB gene have a higher rate of mutagenesis caused by DNA damaging agents. DNA polymerase V (Pol V) is a Y-family DNA polymerase that is involved in SOS response and translesion synthesis DNA repair mechanisms. Transcription of Pol V via the umuDC genes is highly regulated to produce only Pol V when damaged DNA is present in the cell generating an SOS response. Stalled polymerases causes RecA to bind to the ssDNA, which causes the LexA protein to autodigest. LexA then loses its ability to repress the transcription of the umuDC operon. The same RecA-ssDNA nucleoprotein posttranslationally modifies the UmuD protein into UmuD' protein. UmuD and UmuD' form a heterodimer that interacts with UmuC, which in turn activates umuC's polymerase catalytic activity on damaged DNA. In E. coli, a polymerase “tool belt” model for switching pol III with pol IV at a stalled replication fork, where both polymerases bind simultaneously to the β-clamp, has been proposed. However, the involvement of more than one TLS polymerase working in succession to bypass a lesion has not yet been shown in E. coli. Moreover, Pol IV can catalyze both insertion and extension with high efficiency, whereas pol V is considered the major SOS TLS polymerase. One example is the bypass of intra strand guanine thymine cross-link where it was shown on the basis of the difference in the mutational signatures of the two polymerases, that pol IV and pol V compete for TLS of the intra-strand crosslink. Family X polymerases contain the well-known eukaryotic polymerase pol β (beta), as well as other eukaryotic polymerases such as Pol σ (sigma), Pol λ (lambda), Pol μ (mu), and Terminal deoxynucleotidyl transferase (TdT). Family X polymerases are found mainly in vertebrates, and a few are found in plants and fungi. These polymerases have highly conserved regions that include two helix-hairpin-helix motifs that are imperative in the DNA-polymerase interactions. One motif is located in the 8 kDa domain that interacts with downstream DNA and one motif is located in the thumb domain that interacts with the primer strand. Pol β, encoded by POLB gene, is required for short-patch base excision repair, a DNA repair pathway that is essential for repairing alkylated or oxidized bases as well as abasic sites. Pol λ and Pol μ, encoded by the POLL and POLM genes respectively, are involved in non-homologous end-joining, a mechanism for rejoining DNA double-strand breaks due to hydrogen peroxide and ionizing radiation, respectively. TdT is expressed only in lymphoid tissue, and adds "n nucleotides" to double-strand breaks formed during V(D)J recombination to promote immunological diversity. Pol α (alpha), Pol δ (delta), and Pol ε (epsilon) are members of Family B Polymerases and are the main polymerases involved with nuclear DNA replication. 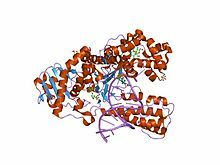 Pol α complex (pol α-DNA primase complex) consists of four subunits: the catalytic subunit POLA1, the regulatory subunit POLA2, and the small and the large primase subunits PRIM1 and PRIM2 respectively. Once primase has created the RNA primer, Pol α starts replication elongating the primer with ~20 nucleotides. Due to its high processivity, Pol δ takes over the leading and lagging strand synthesis from Pol α.:218–219 Pol δ is expressed by genes POLD1, creating the catalytic subunit, POLD2, POLD3, and POLD4 creating the other subunits that interact with Proliferating Cell Nuclear Antigen (PCNA), which is a DNA clamp that allows Pol δ to possess processivity. Pol ε is encoded by the POLE1, the catalytic subunit, POLE2, and POLE3 gene. It has been reported that the function of Pol ε is to extend the leading strand during replication, while Pol δ primarily replicates the lagging strand; however, recent evidence suggested that Pol δ might have a role in replicating the leading strand of DNA as well. Pol ε's C-terminus region is thought to be essential to cell vitality as well. The C-terminus region is thought to provide a checkpoint before entering anaphase, provide stability to the holoenzyme, and add proteins to the holoenzyme necessary for initiation of replication. Pol η (eta), Pol ι (iota), and Pol κ (kappa), are Family Y DNA polymerases involved in the DNA repair by translesion synthesis and encoded by genes POLH, POLI, and POLK respectively. Members of Family Y have five common motifs to aid in binding the substrate and primer terminus and they all include the typical right hand thumb, palm and finger domains with added domains like little finger (LF), polymerase-associated domain (PAD), or wrist. The active site, however, differs between family members due to the different lesions being repaired. Polymerases in Family Y are low-fidelity polymerases, but have been proven to do more good than harm as mutations that affect the polymerase can cause various diseases, such as skin cancer and Xeroderma Pigmentosum Variant (XPS). The importance of these polymerases is evidenced by the fact that gene encoding DNA polymerase η is referred as XPV, because loss of this gene results in the disease Xeroderma Pigmentosum Variant. Pol η is particularly important for allowing accurate translesion synthesis of DNA damage resulting from ultraviolet radiation. The functionality of Pol κ is not completely understood, but researchers have found two probable functions. Pol κ is thought to act as an extender or an inserter of a specific base at certain DNA lesions. All three translesion synthesis polymerases, along with Rev1, are recruited to damaged lesions via stalled replicative DNA polymerases. There are two pathways of damage repair leading researchers to conclude that the chosen pathway depends on which strand contains the damage, the leading or lagging strand. Pol ζ another B family polymerase, is made of two subunits Rev3, the catalytic subunit, and Rev7, which increases the catalytic function of the polymerase, and is involved in translesion synthesis. Pol ζ lacks 3' to 5' exonuclease activity, is unique in that it can extend primers with terminal mismatches. Rev1 has three regions of interest in the BRCT domain, ubiquitin-binding domain, and C-terminal domain and has dCMP transferase ability, which adds deoxycytidine opposite lesions that would stall replicative polymerases Pol δ and Pol ε. These stalled polymerases activate ubiquitin complexes that in turn disassociate replication polymerases and recruit Pol ζ and Rev1. Together Pol ζ and Rev1 add deoxycytidine and Pol ζ extends past the lesion. Through a yet undetermined process, Pol ζ disassociates and replication polymerases reassociate and continue replication. Pol ζ and Rev1 are not required for replication, but loss of REV3 gene in budding yeast can cause increased sensitivity to DNA-damaging agents due to collapse of replication forks where replication polymerases have stalled. Pol γ (gamma) and Pol θ (theta) are Family A polymerases. Pol γ, encoded by the POLG gene, is the only mtDNA polymerase and therefore replicates, repairs, and has proofreading 3'–5' exonuclease and 5' dRP lyase activities. Any mutation that leads to limited or non-functioning Pol γ has a significant effect on mtDNA and is the most common cause of autosomal inherited mitochondrial disorders. Pol γ contains a C-terminus polymerase domain and an N-terminus 3'–5' exonuclease domain that are connected via the linker region, which binds the accessory subunit. The accessory subunit binds DNA and is required for processivity of Pol γ. Point mutation A467T in the linker region is responsible for more than one-third of all Pol γ-associated mitochondrial disorders. While many homologs of Pol θ, encoded by the POLQ gene, are found in eukaryotes, its function is not clearly understood. The sequence of amino acids in the C-terminus is what classifies Pol θ as Family A polymerase, although the error rate for Pol θ is more closely related to Family Y polymerases. Pol θ extends mismatched primer termini and can bypass abasic sites by adding a nucleotide. It also has Deoxyribophosphodiesterase (dRPase) activity in the polymerase domain and can show ATPase activity in close proximity to ssDNA. ^ Bollum FJ (August 1960). "Calf thymus polymerase". The Journal of Biological Chemistry. 235: 2399–403. PMID 13802334. ^ Falaschi A, Kornberg A (April 1966). "Biochemical studies of bacterial sporulation. II. Deoxy- ribonucleic acid polymerase in spores of Bacillus subtilis". The Journal of Biological Chemistry. 241 (7): 1478–82. PMID 4957767. ^ Lehman IR, Bessman MJ, Simms ES, Kornberg A (July 1958). "Enzymatic synthesis of deoxyribonucleic acid. I. Preparation of substrates and partial purification of an enzyme from Escherichia coli". The Journal of Biological Chemistry. 233 (1): 163–70. PMID 13563462. ^ Richardson CC, Schildkraut CL, Aposhian HV, Kornberg A (January 1964). "Enzymatic synthesis of deoxyribonucleic acid. XIV. Further purification and properties of deoxyribonucleic acid polymerase of Escherichia coli". The Journal of Biological Chemistry. 239: 222–32. PMID 14114848. ^ Schachman HK, Adler J, Radding CM, Lehman IR, Kornberg A (November 1960). "Enzymatic synthesis of deoxyribonucleic acid. VII. Synthesis of a polymer of deoxyadenylate and deoxythymidylate". The Journal of Biological Chemistry. 235: 3242–9. PMID 13747134. ^ Zimmerman BK (May 1966). "Purification and properties of deoxyribonucleic acid polymerase from Micrococcus lysodeikticus". The Journal of Biological Chemistry. 241 (9): 2035–41. PMID 5946628. ^ "The Nobel Prize in Physiology or Medicine 1959". Nobel Foundation. Retrieved December 1, 2012. ^ "DNA polymerase III holoenzyme". Wikipedia. Retrieved April 4, 2017. ^ Tessman I, Kennedy MA (February 1994). "DNA polymerase II of Escherichia coli in the bypass of abasic sites in vivo". Genetics. 136 (2): 439–48. PMC 1205799  . PMID 7908652. ^ Garrett, Grisham (2013). Biochemistry. Mary Finch. ^ Hunter WN, Brown T, Anand NN, Kennard O (1986). "Structure of an adenine-cytosine base pair in DNA and its implications for mismatch repair". Nature. 320 (6062): 552–5. Bibcode:1986Natur.320..552H. doi:10.1038/320552a0. PMID 3960137. ^ Swan MK, Johnson RE, Prakash L, Prakash S, Aggarwal AK (September 2009). "Structural basis of high-fidelity DNA synthesis by yeast DNA polymerase delta". Nature Structural & Molecular Biology. 16 (9): 979–86. doi:10.1038/nsmb.1663. PMC 3055789  . PMID 19718023. ^ Steitz TA (June 1999). "DNA polymerases: structural diversity and common mechanisms". The Journal of Biological Chemistry. 274 (25): 17395–8. doi:10.1074/jbc.274.25.17395. PMID 10364165. ^ a b c d e Losick R, Watson JD, Baker TA, Bell S, Gann A, Levine MW (2008). Molecular biology of the gene (6th ed.). San Francisco: Pearson/Benjamin Cummings. ISBN 0-8053-9592-X. ^ McCarthy D, Minner C, Bernstein H, Bernstein C (October 1976). "DNA elongation rates and growing point distributions of wild-type phage T4 and a DNA-delay amber mutant". Journal of Molecular Biology. 106 (4): 963–81. doi:10.1016/0022-2836(76)90346-6. PMID 789903. ^ Boehm EM, Powers KT, Kondratick CM, Spies M, Houtman JC, Washington MT (April 2016). "The Proliferating Cell Nuclear Antigen (PCNA)-interacting Protein (PIP) Motif of DNA Polymerase η Mediates Its Interaction with the C-terminal Domain of Rev1". The Journal of Biological Chemistry. 291 (16): 8735–44. doi:10.1074/jbc.M115.697938. PMC 4861442  . PMID 26903512. ^ Maga G, Hubscher U, Spadari S, Villani G (2010). DNA Polymerases: Discovery, Characterization Functions in Cellular DNA Transactions. World Scientific Publishing Company. ISBN 981-4299-16-2. ^ Choi CH, Burton ZF, Usheva A (February 2004). "Auto-acetylation of transcription factors as a control mechanism in gene expression". Cell Cycle. 3 (2): 114–5. doi:10.4161/cc.3.2.651. PMID 14712067. ^ a b Banach-Orlowska M, Fijalkowska IJ, Schaaper RM, Jonczyk P (October 2005). "DNA polymerase II as a fidelity factor in chromosomal DNA synthesis in Escherichia coli". Molecular Microbiology. 58 (1): 61–70. doi:10.1111/j.1365-2958.2005.04805.x. PMID 16164549. ^ Olson MW, Dallmann HG, McHenry CS (December 1995). "DnaX complex of Escherichia coli DNA polymerase III holoenzyme. The chi psi complex functions by increasing the affinity of tau and gamma for delta.delta' to a physiologically relevant range". The Journal of Biological Chemistry. 270 (49): 29570–7. doi:10.1074/jbc.270.49.29570. PMID 7494000. ^ "DNA Polymerase Families". News-medical.net. 2014-05-06. Retrieved 2014-06-28. ^ Goodman MF (2002). "Error-prone repair DNA polymerases in prokaryotes and eukaryotes". Annual Review of Biochemistry. 71: 17–50. doi:10.1146/annurev.biochem.71.083101.124707. PMID 12045089. ^ Mori T, Nakamura T, Okazaki N, Furukohri A, Maki H, Akiyama MT (2012). "Escherichia coli DinB inhibits replication fork progression without significantly inducing the SOS response". Genes & Genetic Systems. 87 (2): 75–87. doi:10.1266/ggs.87.75. PMID 22820381. ^ Jarosz DF, Godoy VG, Walker GC (April 2007). "Proficient and accurate bypass of persistent DNA lesions by DinB DNA polymerases". Cell Cycle. 6 (7): 817–22. doi:10.4161/cc.6.7.4065. PMID 17377496. ^ Patel M, Jiang Q, Woodgate R, Cox MM, Goodman MF (June 2010). "A new model for SOS-induced mutagenesis: how RecA protein activates DNA polymerase V". Critical Reviews in Biochemistry and Molecular Biology. 45 (3): 171–84. doi:10.3109/10409238.2010.480968. PMC 2874081  . PMID 20441441. ^ Sutton MD, Walker GC (July 2001). "Managing DNA polymerases: coordinating DNA replication, DNA repair, and DNA recombination". Proceedings of the National Academy of Sciences of the United States of America. 98 (15): 8342–9. Bibcode:2001PNAS...98.8342S. doi:10.1073/pnas.111036998. PMC 37441  . PMID 11459973. ^ a b Raychaudhury P, Basu AK (March 2011). "Genetic requirement for mutagenesis of the G[8,5-Me]T cross-link in Escherichia coli: DNA polymerases IV and V compete for error-prone bypass". Biochemistry. 50 (12): 2330–8. doi:10.1021/bi102064z. PMC 3062377  . PMID 21302943. ^ Yamtich J, Sweasy JB (May 2010). "DNA polymerase family X: function, structure, and cellular roles". Biochimica et Biophysica Acta. 1804 (5): 1136–50. doi:10.1016/j.bbapap.2009.07.008. PMC 2846199  . PMID 19631767. ^ Chansky ML, Marks A, Peet A (2012). Marks' Basic Medical Biochemistry: a clinical approach (4th ed.). Philadelphia: Wolter Kluwer Health/Lippincott Williams & Wilkins. p. chapter13. ISBN 160831572X. ^ Chung DW, Zhang JA, Tan CK, Davie EW, So AG, Downey KM (December 1991). "Primary structure of the catalytic subunit of human DNA polymerase delta and chromosomal location of the gene". Proceedings of the National Academy of Sciences of the United States of America. 88 (24): 11197–201. Bibcode:1991PNAS...8811197C. doi:10.1073/pnas.88.24.11197. PMC 53101  . PMID 1722322. ^ Johnson RE, Klassen R, Prakash L, Prakash S (July 2015). "A Major Role of DNA Polymerase δ in Replication of Both the Leading and Lagging DNA Strands". Molecular Cell. 59 (2): 163–175. doi:10.1016/j.molcel.2015.05.038. PMC 4517859  . PMID 26145172. ^ Edwards S, Li CM, Levy DL, Brown J, Snow PM, Campbell JL (April 2003). "Saccharomyces cerevisiae DNA polymerase epsilon and polymerase sigma interact physically and functionally, suggesting a role for polymerase epsilon in sister chromatid cohesion". Molecular and Cellular Biology. 23 (8): 2733–48. doi:10.1128/mcb.23.8.2733-2748.2003. PMC 152548  . PMID 12665575. ^ Ohmori H, Hanafusa T, Ohashi E, Vaziri C (2009). "Separate roles of structured and unstructured regions of Y-family DNA polymerases". Advances in Protein Chemistry and Structural Biology. Advances in Protein Chemistry and Structural Biology. 78: 99–146. doi:10.1016/S1876-1623(08)78004-0. ISBN 9780123748270. PMC 3103052  . PMID 20663485. ^ Gan GN, Wittschieben JP, Wittschieben BØ, Wood RD (January 2008). "DNA polymerase zeta (pol zeta) in higher eukaryotes". Cell Research. 18 (1): 174–83. doi:10.1038/cr.2007.117. PMID 18157155. ^ Zhang L, Chan SS, Wolff DJ (July 2011). "Mitochondrial disorders of DNA polymerase γ dysfunction: from anatomic to molecular pathology diagnosis". Archives of Pathology & Laboratory Medicine. 135 (7): 925–34. doi:10.1043/2010-0356-RAR.1 (inactive 2018-05-12). PMC 3158670  . PMID 21732785. ^ Stumpf JD, Copeland WC (January 2011). "Mitochondrial DNA replication and disease: insights from DNA polymerase γ mutations". Cellular and Molecular Life Sciences. 68 (2): 219–33. doi:10.1007/s00018-010-0530-4. PMC 3046768  . PMID 20927567. ^ Hogg M, Sauer-Eriksson AE, Johansson E (March 2012). "Promiscuous DNA synthesis by human DNA polymerase θ". Nucleic Acids Research. 40 (6): 2611–22. doi:10.1093/nar/gkr1102. PMC 3315306  . PMID 22135286. Burgers PM, Koonin EV, Bruford E, Blanco L, Burtis KC, Christman MF, Copeland WC, Friedberg EC, Hanaoka F, Hinkle DC, Lawrence CW, Nakanishi M, Ohmori H, Prakash L, Prakash S, Reynaud CA, Sugino A, Todo T, Wang Z, Weill JC, Woodgate R (November 2001). "Eukaryotic DNA polymerases: proposal for a revised nomenclature". The Journal of Biological Chemistry. 276 (47): 43487–90. doi:10.1074/jbc.R100056200. PMID 11579108. 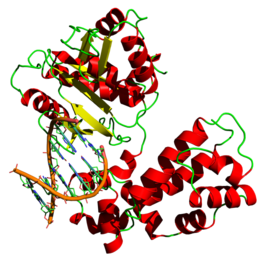 Wikimedia Commons has media related to DNA polymerases. This region of DNA polymerase B appears to consist of more than one structural domain, possibly including elongation, DNA-binding and dNTP binding activities. DNA is the biological information that instructs cells how to exist in an ordered fashion: accurate replication is thus one of the most important events in the life cycle of a cell. This function is performed by DNA- directed DNA-polymerases EC) by adding nucleotide triphosphate (dNTP) residues to the 5'-end of the growing chain of DNA, using a complementary DNA chain as a template. Small RNA molecules are generally used as primers for chain elongation, although terminal proteins may also be used for the de novo synthesis of a DNA chain. Even though there are 2 different methods of priming, these are mediated by 2 very similar polymerases classes, A and B, with similar methods of chain elongation. A number of DNA polymerases have been grouped under the designation of DNA polymerase family B. Six regions of similarity (numbered from I to VI) are found in all or a subset of the B family polymerases. The most conserved region (I) includes a conserved tetrapeptide with two aspartate residues. Its function is not yet known, however, it has been suggested that it may be involved in binding a magnesium ion. All sequences in the B family contain a characteristic DTDS motif, and possess many functional domains, including a 5'-3' elongation domain, a 3'-5' exonuclease domain [PUBMED:8679562], a DNA binding domain, and binding domains for both dNTP's and pyrophosphate [PUBMED:9757117]. This domain of DNA polymerase B appears to consist of more than one activities, possibly including elongation, DNA-binding and dNTP binding [PUBMED:9757117]. For those sequences which have a structure in the Protein DataBank, we use the mapping between UniProt, PDB and Pfam coordinate systems from the PDBe group, to allow us to map Pfam domains onto UniProt sequences and three-dimensional protein structures. The table below shows the structures on which the DNA_pol_B domain has been found. There are 254 instances of this domain found in the PDB. Note that there may be multiple copies of the domain in a single PDB structure, since many structures contain multiple copies of the same protein sequence.